5 Things (Spam Emails) to Ignore This Year! Another year is in the books and a new one has begun. Yeah, I know, it’s hard to believe but here we go! With a new year comes a new To-Do list for wrapping up last year, while checking off the items for kicking off the new year in fine fashion. But rather than add to your list, here are five examples of emails you can ignore all year long! The message is sent to an email other than the one you used to create your Facebook account. The message lacks a personal greeting. Instead of addressing you by your name, as listed in your Facebook account, it uses your email address to greet you (i.e., Hi johnny@workemail.com). The email address displayed next to the From name gives it away (i.e., Facebook Security Team [arbitrary@name.com]. NOTE: Even if it does say it’s from @facebook.com, that doesn’t guarantee it’s legit. But if it doesn’t, that’s a dead giveaway that’s it’s fake!). The email includes a call to action like clicking a link within the body of the message (e.g., If this wasn’t you follow the link below: http://www.fakeurl.com). Please be notified, that your latest Direct Deposit via ACH payment (Int. No. 6478944817996) was rejected, due to your current Direct Deposit software being out of date. Please visit the secure section of our website to see the details. If you still don’t delete it at that point, whatever you do, DO NOT click on the Details link provided in the body of the email. If you’ve read that far in the email, hopefully it’s only because you actually were expecting to receive a direct deposit. Or, as is more frequently the case for most of us, you had scheduled an electronic payment to go out. has a high up status with Microsoft. gearing up for this virus. this is the worst virus announced by CNN. Don’t forget the adage, If it sounds too good to be true, it probably is. That’s even truer online. When you see a promise that the first (insert number) people to Like or Share a post or a page on Facebook will receive a gift card worth (insert dollar value), don’t waste the effort of lifting your index finger to click or tap. Whether it’s a gift card for a popular electronics store or a prepaid Visa debit card, chances are you’ll be redirected to another website, where you’ll be asked to enter personal information — something you never want to do if you’re interested in protecting your identity. The chances are slim you’ll ever receive a gift card. If you’re still tempted, go directly to the company’s Facebook page or website to verify whether the offers are legitimate. Whenever there’s a natural disaster or catastrophe, charities spring into action to help those affected. Unfortunately, the online crooks and scammers mobilize too, preying on people’s compassion and generosity. Beware of requests for donations via text messages, emails, or websites. The con artists are good at tugging at your heartstrings and taking your money, but your money never makes it to your intended party. Verify the validity of any professed charity or fundraiser on your own. Initiate your own search online to find organizations and their websites. Donate directly to a charity like the American Red Cross or United Way by visiting their website. When in doubt, use reputable resources like The Better Business Bureau’s Wise Giving Alliance, The Federal Trade Commission, and Charity Navigator. 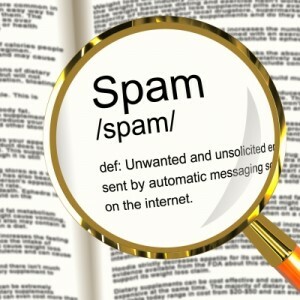 Knowing the signs of scam and spam emails can help you to quickly identify ’em, ignore ’em, and better yet, delete ’em.